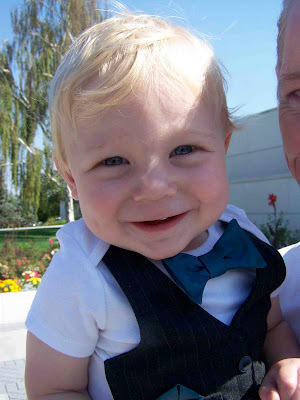 For my brother's wedding we kept Miles' outfit pretty simple. A bow tie and vest bodysuit with matching shorts. The material from the vest and shorts came from a pair of my dad's old dress pants. I love repurposing existing garments, especially when they come from, and go to, people that you love. I added a matching pocket square to the vest, and thought he looked rather handsome. He thought so too. I love this age, he instantly smiles when he sees the camera. I failed to get any great shots of the shorts, but they turned out pretty cute. I added some faux welt pockets to the back (a first for me). 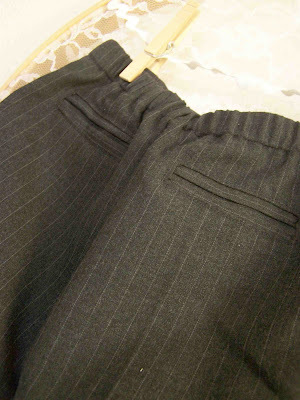 Though I don't have a photo of the front, I used the original tab from the dress pants. My dress came from eShakti. I was really pleased with my dress, my only complaint was the difficulty in ironing out all of the wrinkles from the pleated surplice neckline. 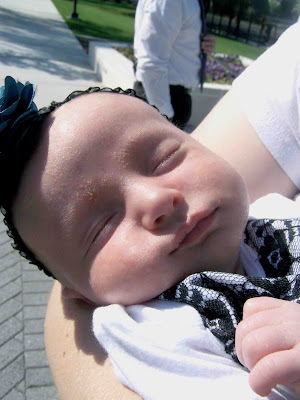 My newest niece, ended up wearing the lace appliqued onesie, with bustled buttercup skirt. She is such a sweet little baby. LOVE the outfit!!!! :) The welt pockets look perfect. :) Maybe you should sell these. :) And you look great! Totally adorable! 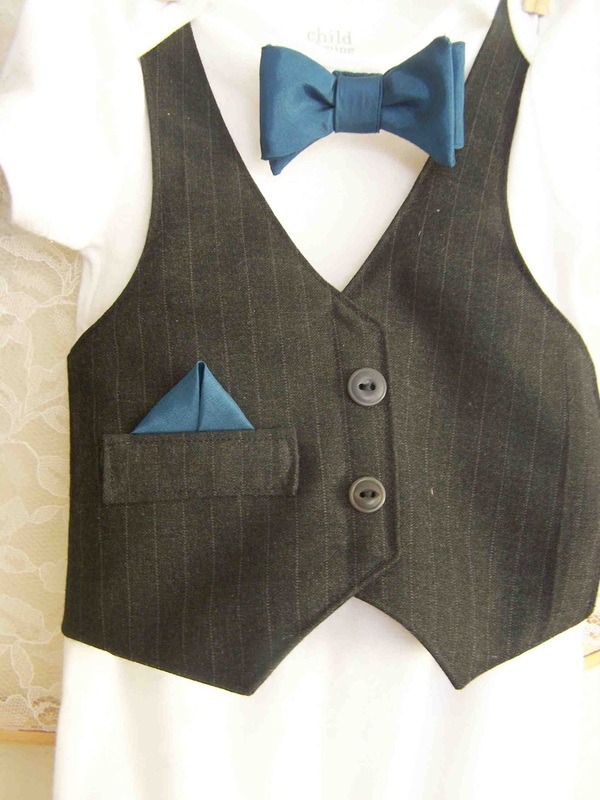 I make onesies with an applique of a tie for little boys, but I love your rendition with a 3-D bow tie and vest. Nice pants to match! The little girl's outfit is adorable, too. 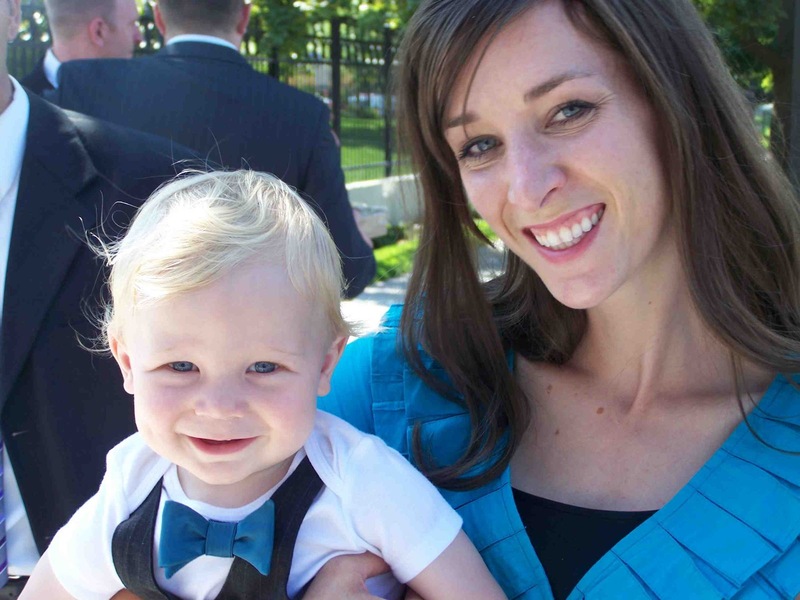 SO cute, Tricia! I love little boys in ties, and vests are even better! Do you make these for others to purchase? This would be a perfect coming home outfit for my newborn due in December, except it being a long sleeve newborn onesie. Please let me know if you make these to sale!!! !